A wide variety of digital modulation schemes exists to transform a bitstream into a continuous time signal to be transmitted over a wire- or wireless transmission lines. Different type of digital modulations (e.g. BPSK, QAM, GMSK, OFDM…), all have their specific properties regarding their efficiency, assumption on the (possible multipath) properties of the channel, the usage of Multiple-Input Multiple-Output (MIMO channels), and their ability to correct for channel imperfections. To be able to handle fast moving systems, which cause Doppler effects on the received channel, a new modulation scheme is proposed in the literature. This so-called Orthogonal Time Frequency Space (OTFS) modulation extends the well-known OFDM modulation (well suited for static channels in the presence of multipath) using a representation of the channel in the delay-Doppler domain. The aim of this thesis is to study the OTFS modulation in all its aspects starting from recent state-of-the-art papers. This will require the study/implementation/analysis of both the standard OFDM modulation schemes (including the cyclic prefix, the use of pilot tone to compensate the channel response,…) and the extension proposed in the paper. Other hardware impairments (such as Carrier Frequency Offset and Sampling Frequency Offset …) are not considered since they are not relevant for this simulation-based study. 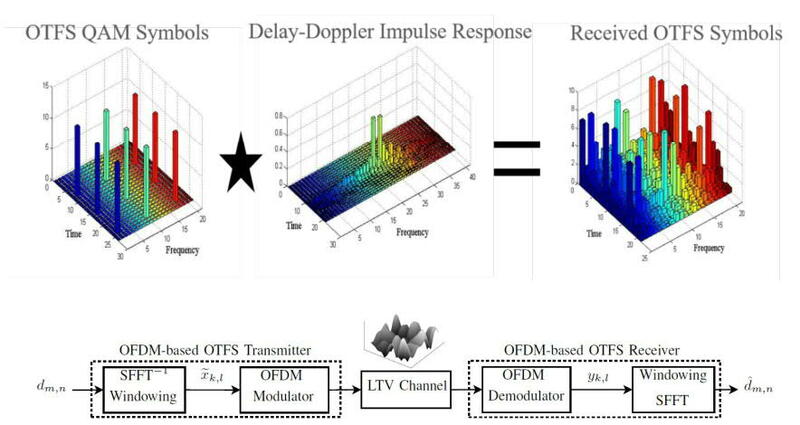 The result of the thesis should be the simulation code in Matlab, an in-depth analysis of OTFS, and the comparison with classical OFDM when a Doppler effect is present in the channel. This thesis will enable you to master the different aspect of the digital modulation schemes and signal processing techniques that come with it.